It’s amazing how many streets in New York City yield views of One World Trade Center. 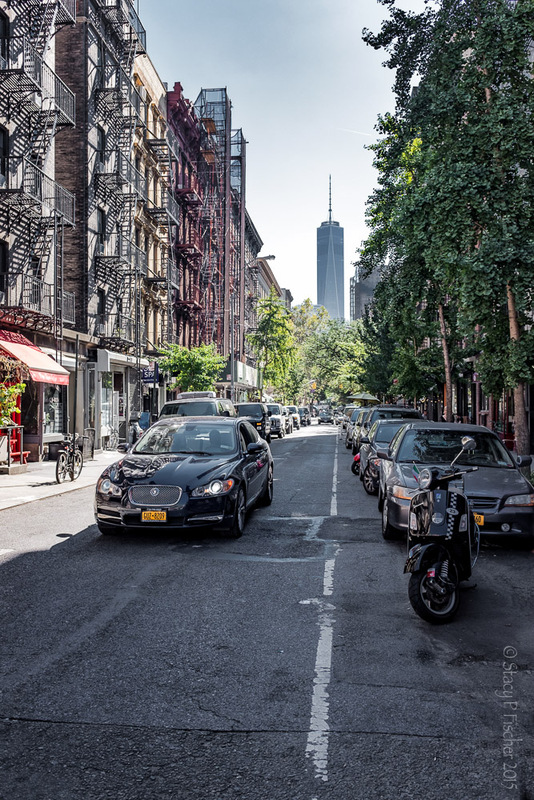 This is Sullivan Street in Greenwich Village, just south of Washington Square Park. For a black and white version, visit Monochromia. This entry was posted in Architecture, Cityscapes, New York City, Places and tagged architecture, buildings, Fuji X100T, New York City, photography, postaday, urban landscape, urban photography. Bookmark the permalink. You have captured the brooding and commanding presence of this building so beautifully Stacy, the old beneath the new . . .
Patti, you chose the perfect words to describe the exact feeling I get whenever I catch a glimpse of this building in unexpected places. Thanks so much. I loved this photo. The colors are beautiful, and the whole picture is so nicely balanced. Very nice both version ! But my best is the B&W ! Shhh, don’t tell anybody, but the B&W is my favorite too, Max 😉 Thanks so much! Wonderful picture. I like the perspective, and how your eye is led to the tower. And the street in shadow with the skyline in light. I love this picture. My first thought was ‘where is that?’ Then I saw the TC. I like the textures, which pop and almost give it a tropical look and all those fire escapes! NYC is so busy visually that seeing your beautifully grounded photos (always with a focal point amid the busyness) is an education in seeing. Lisa, what an incredibly kind thing to say. Truly, I appreciate it more than you can know.